Our Owlette Program is one of Origami Owl®’s foundational programs – and we’re proud to add a few new enhancements to make it even more rewarding for our 11-to-17-year-olds who start their businesses with an adult. The Owlette Program is committed to living out the pillars of the Origami Owl mission: to be a Force For Good®; to love, inspire and motivate people of all ages to reach their dreams and empower them to make a difference in the lives of others. The four pillars that form the foundation of the Owlette experience are: sales, sponsoring, personal development and being a Force For Good. This new achievement program is kind of like the Girl Scouts program; it starts the moment someone becomes an Owlette, and they will then have the opportunity to earn Charms throughout every year they are in the Owlette Program. We will be adding new Charms to achieve each year. The first Charm they get is their Owlette Charm and the final Charm will be their Graduation Cap. For each pillar of the business and mission that’s achieved during the year, Owlettes will earn an exclusive piece of jewelry to include in a special look. Please note, these recognition items will be awarded every year on stage at The O2 Experience. Those who are unable to attend will receive the items in the mail following the event. Light Turquoise Twist Living Locket™ Face + Silver Inscriptions® Base and Ball Station Chain – represents making a difference in the lives of others. How to Earn It: Generate 250 PV in two, consecutive months by hosting two Jewelry Bars®: one must be an in-home Jewelry Bar while the other can be a second in-home or a virtual Jewelry Bar. Plus, help someone join your team and when they generate 100 PV, you’ll earn the entire look! Owlette Charm – represents our unique program focused on empowering our youth. 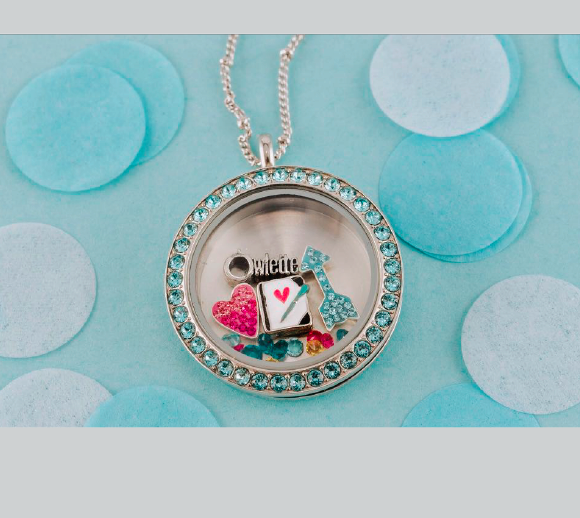 You’ll receive this shortly after you enroll with an existing Designer or start your Origami Owl business. Live Sparkly® Swarovski® Multicolor Stardust – represents being a Force For Good and sprinkling kindness – like stardust – in our communities. How to Earn It: You must take a leadership role in a project focused on giving back to an organization or helping others. How to Submit: Email a few paragraphs about what you did, what you learned from the experience and what it meant to be part of this project to Owlettes@OrigamiOwl.com. Notebook with Aqua Pen Charm – represents to “love, inspire and motivate” people of all ages. How to Earn It: You must lead a team meeting in-person, and one more through an online event, such as Facebook, where you share a presentation. You must also learn to recite the Origami Owl mission from memory. How to Submit: Email a video of your Owlette/BRO presenting at their meeting and reciting the mission statement to Owlettes@OrigamiOwl.com. How to Earn It: Create a vision board capturing all of your hopes, goals and dreams. How to Submit: Email a video or a picture and a few paragraphs to Owlettes@OrigamiOwl.com describing your vision and the steps you plan to take to reach them. Exclusive Pink Ombre Sparkly Heart Charm – represents personal growth. How to Earn It: You must attend two out of the four Owlette Personal Development Zoom sessions. How to Submit: Email a few paragraphs listing the sessions you participated in, which personal development session most influenced you, and share a few details about it, including the date, topic and how you’re applying the lesson to Owlettes@OrigamiOwl.com. *Please note, only one exclusive jewelry piece will be awarded per activity achieved during your time as an Owlette. Rewards period is August 1, 2018 to April 30, 2019 regardless of join date. The Force For Good Flower Charm will give back 100% of the profits to Camp Sunshine, a non-profit organization that covers the expenses of bringing children with life-threatening illnesses and their families to a safe, supportive, healing environment for a week of friendships and fun. Elizabeth and Isabella’s Charm will launch with our Fall/Winter 2018 Collection on August 1. We have so many 11-to-17-year-old boys who’ve joined Origami Owl and want to belong to a brotherhood that feels current and fun. Owlette Council Member Jaden Saysanam suggested creating the “BRO Squad” and we couldn’t agree more! “BRO” stands for “Boys Representing Origami Owl.” Keep an eye out for BRO Squad-branded apparel and more to support this OWL-some group of guys! We want to support our Owlettes and “BROs” whose goals are to continue their education at a university or technical school once they graduate from high school. That’s why we are thrilled to share our new, annual Owlette Education Award. We will recognize two Owlette recipients on stage at 2019 Convention and each will receive a check for $2,000 to put toward their continuing education costs. Please note, you must be a current Owlette to qualify. Keep an eye out for more details on how Owlettes in 2018 can apply for this incredible award! When our Owlettes graduate from the program at age 18, they have the chance to continue their Origami Owl journey in several ways. They may create a new Independent Designer account and will have the option to purchase a Starter Kit for only $49 for the new account (effective August 1, 2018), or they can create their own account without the Starter Kit (the Starter Kit is optional). If they prefer to become an Independent Designer under the same account, the account must be converted to an LLC or other form of business entity. We’re so proud of how our Owlette Program is growing and we can’t wait to see whooo you introduce it to next!